Surrounded by coastal rainforest and located on one of the most beautiful palm studded beaches in Brazil, Villas de Trancoso is far from the beaten path. Fully integrated into the lush tropical landscape you will find ten luxury one and two bedroom villas, sumptuous cuisine, golden sand beaches, and a most attentive staff. All combine to create a unique retreat experience whether you are a honeymoon couple seeking romance or a family wishing to spend special time together. The Villa's lush grounds include a spa with pool, a second white marble pool, restaurant and business center. On the beach you will find a health and fitness center fashioned entirely from wood along with waterfall showers and the Villa's beach bar. The palm studded beach includes comfortable shaded sofas and lounges, a small gym fashioned from wood, beach bar and miles of endless golden sand. 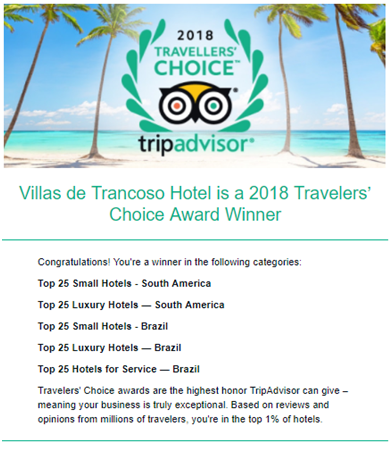 In 2018 the hotel received Trip Advisor's Travelers Choice Awards in 5 categories including the #2 luxury hotel in Brazil. For more information about our Villas, our village and our service go to ABOUT or contact us by phone, email or Whatsapp: +55 73 9 8844-0575.